The following post was contributed by Geraldine McGinty, MD, MBA, FACR. Wondering what’s the latest on the American College of Radiology’s (ACR) efforts to respond to the Medicare Access and CHIP Reauthorization Act of 2015 (MACRA) legislation? I’m happy to report that our multi-commission team is firing on all cylinders to ensure that we provide policy makers with a robust set of recommendations for how radiologists can be maximally engaged in the transition to value based payments. For example, technical and subspecialty content experts are currently reviewing Medicare’s “episode grouper” logic, identifying which services should be included in episodes of care. Recognizing that Centers for Medicare & Medicaid Services (CMS) is receiving vast amounts of feedback from across the health care delivery system, we are also crystallizing our recommendations into a short document to ensure that CMS understands where we see radiologists succeeding and advancing the goals of MACRA and, perhaps even more importantly, which measures or components of the Merit-Based Incentive Payment System (MIPS) program need to be adjusted specifically for radiology. A good example of this is the “resource use” component that typically measures physicians on the cost of the care for which they are responsible. This simply doesn’t work for radiologists. While we are developing models around clinical decision support (CDS) that may well be able to align radiologists with the degree to which they can influence imaging utilization, these may not be ready to go immediately especially since CMS has delayed implementation of the Protecting Access to Medicare Act of 2014 (PAMA) legislation that mandates the use of CDS. We want our entire radiology community to be part of this effort, so please leave your comments below if you have questions or ideas. This post was contributed by Kristopher N. Lewis, MD, assistant professor of radiology at Augusta University and section chief for pediatric radiology at the Children’s Hospital of Georgia, Augusta. For truly patient-centered care, radiologists must engage patients to find out what they expect from their health care experience. We often think we know what’s best for patients. But until we actually ask patients what they want, we risk making uninformed assumptions that could lead to unnecessary costs and ineffective programs. To encourage radiologists to include patients in the care process, the ACR recently formed the Patient- and Family-Centered Care Commission. At the Children’s Hospital of Georgia, we have a long history of providing patient- and family-centered care. So when we decided to redesign our pediatric imaging suite, we followed our usual protocol and gathered input from patients and their families. We wanted to create an inviting facility that calms patients and families and allows them to be more involved in their care. We worked with an architectural and consulting team to develop a preliminary design, which we then presented to the patient advisory panel for their input. We also took informal surveys of patients and families who visited the imaging suite, gathering details about both their good and bad experiences in the department. We aggregated that information to produce a design that includes an interactive video wall that engages patients as they wait for their exams, a pretend CT scanner that teaches patients and families about their imaging exams, a secondary waiting area where patients and families can talk more privately with technologists and radiologists, and an ambient sound and lighting system that soothes patients during their exams. Since the redesign was completed last September, patients have reported increased satisfaction with the pediatric imaging department — demonstrating that when it comes to improving the patient experience, we are most successful when we consult the experts: patients themselves. Have you started or worked with a patient advisory board? What has been your experience? This post is contributed by Debra Monticciolo, MD, FACR, chair of the American College of Radiology Breast Imaging Commission. This week the U.S. Preventive Services Task Force (USPSTF) doubled down on its 2009 recommendation firmly supporting only biennial mammograms for women aged 50–74. They said women 40–49 should talk to their doctors; however, they didn’t outright recommend this age group get tested due to anxiety over test results or further testing to clarify diagnosis. The American College of Radiology (ACR) and every other major medical organization expert in breast cancer care recommend that women 40 and older get screened every year. The College and the Society of Breast Imaging (SBI) assembled our troops (members) and responded in force. 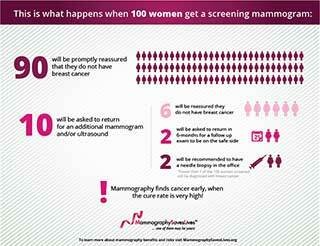 The College created this poster for radiologists to put in their waiting rooms and lobbies – which goes well with this infographic for use on practice and department websites – and other breast imaging resources. These efforts built on ACR-backed inclusion of provisions in the recently passed Consolidated Appropriations Act – which barred any changes to mandatory mammography insurance coverage for two years (based on these Task Force recommendations). Such public arena advocacy works hand-in-glove with ACR efforts on Capitol Hill and in state houses nationwide. Here is yet another reason why the College is so vital to our profession and our practices. We all must continue to work together to improve radiology, safeguard access to care and move our profession into the future. We want to hear: What steps did you take regarding the USPSTF recommendations? Did you speak with your local reporters and get quoted or appear in local broadcasts?